Ticks- What can I do about them?! My first experience with a tick was seeing something small and oval, like a small brown pebble, on my dog’s ear. On further inspection, I noticed the round bodied thing had lots of legs! Relatives of the spider, adult ticks also have eight legs on the underside of their body. Depending on the lifestage of the tick, and whether it has had a meal, they can vary in size from a few millimeters to up to 1.0cm! The tick lifecycle depends on which species of tick we are discussing. The most common tick in this area is the American Dog Tick (Dermacentor variabilis), with the recently emerging tick in the area being the Deer Tick (Ixodes scapularis) which is mainly found at the provincial parks, but is also now found at Malden Park as well as other areas in the city. They feed on many different types of mammals, rodents and birds, allowing them to thrive. Since these ticks can feed on birds, they can drop off practically anywhere. Which is likely why the first tick I found on my dog was acquired in our fenced-in backyard. Found usually in grasses, they sit at the tip of grass blades waving their front legs, waiting to grasp onto anything that walks by. Ticks feed by embedding their mouthparts in the body of an animal, preferring dark areas such as the groin, armpits, and around the ears and neck. They drink blood to feed, and can be attached for up to a few days until they are fully fed. When fed, they fall off the animal to fully digest their food. Females will lay their eggs on the underside of grass blades or leaves to start the lifecycle once more. Ticks can transmit diseases, such as Lyme disease, Rocky Moutain Spotted Fever, Tick paralysis, Erlichia, just to name a few, and different species of ticks can contain a different spectrum of diseases. For example, the American Dog tick does not carry Lyme disease, while the Deer Tick is the most common tick to spread this disease. So, what can we do about it? 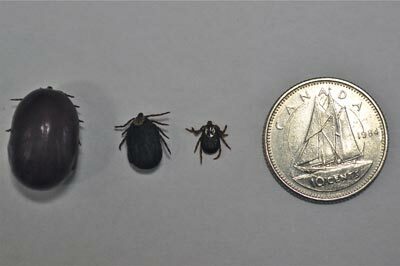 After bringing in your dog from your backyard, and especially after bringing them for walks at the provincial parks or while camping, run your hands over every inch of their body to ensure there are no ticks. If you do find a tick, it should be removed. We have a small device called ‘tick pullers’ which can be placed at the base of the tick and used much like the back end of a hammer to detach the tick. If you are unable to get to a vet and do not have ‘tick pullers’, you can also use tweezers. Grasp near the base of the tick, pull, being careful not to sever the mouthparts with the tweezers. If a piece of the mouthparts are left in the body of the dog, it acts much like a sliver- it will make its way out over time, but could predispose to infection in that area. Because it takes up to 24 hours for Borrellia burgdorferi (the parasite that causes Lyme disease) to move from the stomach of the tick to the body of the dog, removing the tick promptly should be the first step to preventing Lyme disease. Unfortunately, other tick diseases such as Erlichia can take as little as 3 hours to pass from the tick to our dog. Bring that removed tick into your Veterinarian, it can be sent to a laboratory for testing, to see if it is carrying any diseases which could put your animal at risk. For dogs at increased risk, those who go camping or walking through the Provincial Parks often, or who are acquiring ticks in the backyard, there is a Lyme vaccine which can aid in the fight against Lyme disease. Also, preventative medications to help kill or repel ticks are also available at your veterinarian. Give us a call and we can discuss this in further detail.